Protein plays key roles in your body by promoting muscle building and repair, hormone synthesis, and more! Because it does so many important things, it’s critical to make sure you get enough protein every day. Protein is composed of smaller functional groups called amino acids. Of the 20 known amino acids, 9 of them are considered essential, meaning that they are not produced in the body and must be supplied by the foods you eat. Food sources that contain all nine essential amino acids are considered to be a complete protein. The most common complete protein sources are animal proteins like meat, fish, eggs, and dairy products, as well as whey protein powder supplements, because they contain the 9 essential amino acids. But for those living a vegan lifestyle for health, ethical, medical, or other reasons, and looking to be more environmentally friendly, these protein sources are not viable options. Plant protein is a vegan-friendly option that can help those abstaining from animal products to reach their protein needs. But most plant proteins don’t provide all the essential amino acids, so they aren’t considered a complete protein, like animal proteins. One solution to this problem is plant-based protein powder. While most plants aren’t complete proteins on their own, multiple plant sources can be combined with key nutrient profiles to become a complete protein. Plant protein powder is more easily digested than other protein powders like whey, and it’s more environmentally friendly! It can also help you meet your muscle building needs, and is used by many top athletes and bodybuilders who have adopted a vegan lifestyle. But not all plant-based protein powders are created equal. When searching for a plant protein powder, you want something that contains the right blend of sources to provide a complete protein. But you want both taste and nutrition-you want a product that you’ll actually enjoy! 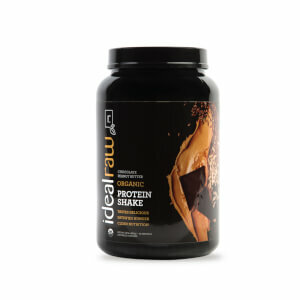 IdealRaw Organic Protein is a delicious vegan protein powder option that provides everything necessary to fulfill your protein needs and help you build a strong healthy body from the inside out! Sourced from seven different plant-based and vegan protein sources, IdealRaw Organic Protein contains all nine essential amino acids, making it a complete protein! It also contains a superfood blend providing added vitamins and minerals to support a healthy lifestyle! What’s even better is that it tastes amazing! Our IdealRaw team spent two and a half years formulating ingredients, adding superfoods, testing proteins, and conducting over 200 separate taste tests to get the flavor just right. 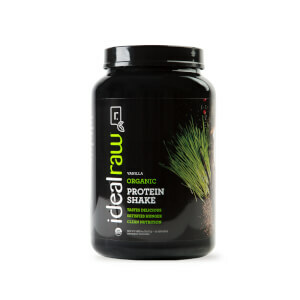 In addition to it’s amazing taste and outstanding nutritional profile, IdealRaw Protein is organic, dairy-free, gluten-free, soy-free, non-GMO, and naturally sweetened, making it the best product available for vegan-friendly plant-based protein. No more hassle, just clean nutrition on-the-go! Can I View IdealRaw's Nutrition Facts? 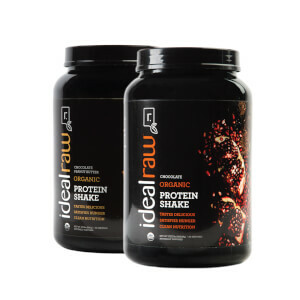 IdealRaw Organic Protein shakes contain responsibly sourced ingredients and a nutritional profile that can fit anyone's diet! What Are the Ingredients? What Do They Do For Me? Organic Rice Protein — Made from whole grain brown rice, rice protein is hypoallergenic and easily digestible. Rice protein also features antioxidants, B-Vitamins, and important dietary fiber. Research has shown it to create similar fat-loss and muscle-growth to whey protein over an 8-week period. Organic Pea Protein — You might not think “protein” when looking at peas, but these little green guys pack in some amazing benefits. Pea protein is easy to digest, and is high in BCAAs (branched chain amino acids) which are essential for muscle recovery and repair. Pea protein is also low in carbohydrates, and can actually help you feel less hungry in between meals. Organic Coconut Protein — You may know coconut best for it’s water, milk, and oil, but coconuts are actually packed with protein too! Featuring 17 of the 20 amino acids, coconut also provides support to your nervous system, connective tissues, and even supports youthful looking skin. Aloha to that! Organic Chia Protein — One of the earliest known superfoods, chia seeds were held sacred by the ancient Mayans and Aztec civilizations. Maybe they were onto something— chia is packed full of protein and healthy omega acids, as well as impressive amounts of many essential vitamins and minerals. Organic Sunflower Protein — Turns out sunflowers aren’t just for looks! Sunflower protein is a complete protein, featuring all 20 amino acids your body needs. Sunflower protein also packs in a sizeable helping of BCAAs for muscle recovery and repair. Organic Golden Flax Protein — Grown for thousands of years, golden flaxseed may be worth it’s weight in gold for good health. A low-carb vegan protein, organic golden flax protein also contains heart-healthy omega-3 fatty acids, along with antioxidants and fiber. Organic Pumpkin Protein — One of the best organic products out there, mineral and vitamin-rich pumpkin protein is an excellent plant protein. Pumpkin protein is a great source of omega acids and is high in vitamin K.
Organic Coconut Milk — Delicious coconut milk is lactose-free, meaning it is perfect for those with sensitive systems. Coconut milk is rich in B-vitamins, minerals, and heart-healthy fats. Organic Cocoa Powder — In the Americas, cocoa was the “food of the gods,” and today we love it for its heavenly taste and health benefits. Organic cocoa powder is full of healthy antioxidants and can boost the “feel-good” chemistry in your brain. Organic Stevia — This natural sweetener comes from the stevia plant of South America. It is much sweeter than sugar, so far less is needed. Using organic stevia means that IdealRaw Protein has only 2g of natural sugars per serving. Organic Cranberries — One of the best superfoods, cranberries offer powerful antioxidant, anti-inflammatory, and infection-fighting benefits. They’re also a source of fiber and vitamins C, E and K.
Organic Pomegranate — An ancient fruit, pomegranates are still prized today for their powerful antioxidants. Pomegranate juice has been found to have 3x the antioxidants of green tea! Pomegranate can also help control blood pressure and cholesterol. Organic Broccoli — Broccoli can help to detox your body, and is rich in vitamin A, K and C, as well as folate, chromium and fiber. This green veggie can also help out with cholesterol. Organic Wheat Grass — Strong-tasting wheat grass juice is a popular option at smoothie shops, it has some strong nutritional benefits too! Wheat Grass contains 98 of the 102 earth elements, making it an incredibly diverse source of many nutrients. Organic Beet Powder — Bright-red beets are rich in health and stamina-boosting iron. They also help to detox your body and blood stream. Is IdealRaw Safe For Pregnant And Nursing Mothers? Yes, IdealRaw is a safe protein option for current or soon to be mothers. Since IdealRaw contains nothing but plants and nothing artificial, you don’t have to worry. 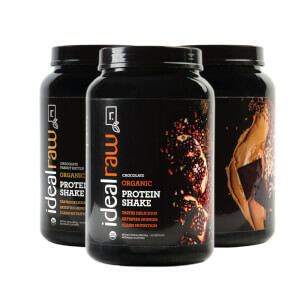 IdealRaw provides a way to better nourish your body and provide it the protein and nutrition it needs. Our plant protein sources are hypoallergenic to most people, meaning they won’t cause any negative reactions. As always, if you have specific questions or concerns, speak with your physician before taking this or any supplement. What is IdealRaw Sweetened With? 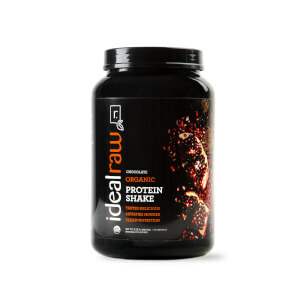 IdealRaw is sweetened with organic stevia and contains nothing artificial. Whether you have a sensitivity to artificial sweeteners or simply just want to avoid them, you can rest assured that IdealRaw is the best in clean nutrition. Reduced Environmental Impact — Raising animals and animal products uses large amounts of resources, including 1,000’s of gallons of water and produces lots of CO2. Plant protein consumes far less water, and produces only around 1/10th of the carbon emissions. Can You Build Muscle with Plant-Based Protein Powder? Many top-level professional athletes from around the world have adopted a vegan lifestyle, and there are even a number of vegan professional bodybuilders, which goes to show that it is possible to build muscle and develop an athletic body with plant-based protein. Your body needs protein to recover from workouts and build lean strong muscle. Protein is protein, and regardless of the source it can fulfill your recovery needs! How Do Plant and Whey Protein Compare? Whey is a complete protein containing all nine essential amino acids. A blend of plant protein sources can be readily prepared that contains all nine essential amino acids, fulfilling your protein needs the same as whey. Whey is known for a smooth texture and easy mixability. While some plant proteins can be gritty and resistant to mixing, the right blend can rival whey protein in smoothness and can be extremely mixable. Whey is highly touted as a great protein source by those trying to build muscle. As previously mentioned, multiple plant sources can be combined to form a complete protein, making it just as effective for muscle building.